Taiwan Bike Routes Map records Taiwan bike routes that Alan (website owner) has ridden before. Some were events and some Alan rode alone. 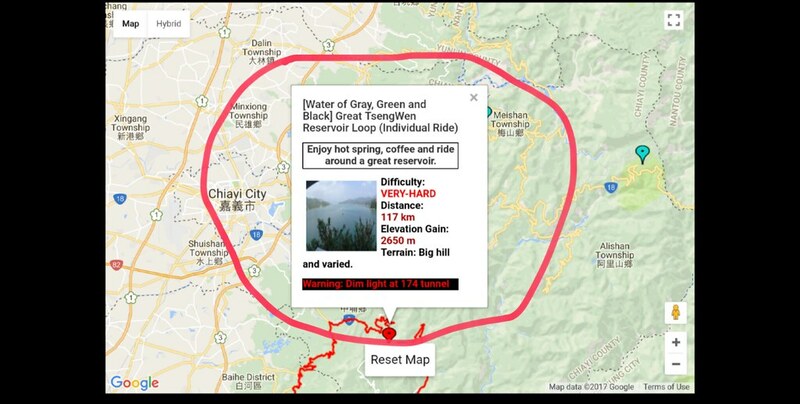 Alan hopes this map would be useful for people to discover great routes and cycle in Taiwan. 台灣單車路線地圖記錄 Alan (此網站的擁有者) 騎過的路線. 這些路線有的是活動, 有的是 Alan 自己獨騎過的. The markers indicate the approximated location of a bike route. The marker color indicates the route’s difficulty. When users click on the markers, a route summary as well as map appear. when users click the summary, a full ride report (with route map and photos) appears. To go back to the original map, hit the “reset” button. Approximate elevation gain in meter. WARNING of hazard if applicable. The “Difficulty” information is classified as follows, all under “normal riding temperature” (20-30 Celsius). Relatively flat all along the way (elevation < 1000m) & distance < 100km. Decent climbing (elevation ~ 1500m) with distance < 100km. Flat with distance over 200km. Many climbing (elevation ~ 2000m) plus at least metric century (> 100km). Ultra big hill (elevation > 3000m) with steep section. The list is arranged from north to south. Color indicates difficulty.